She Was Just Seventeen by Billy Collins. (Lincoln: IL, 2006). 32 pages, 8" x 5", sewn letterpress edition. ISBN 0-9741894-2-1. Very nearly out of print. 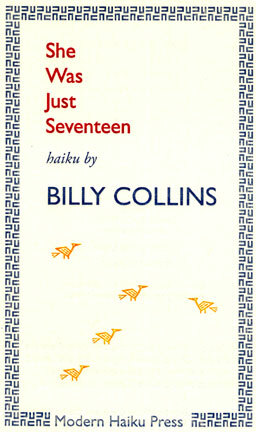 Modern Haiku Press is delighted to announce that we still have a few copies of Billy Collins' She Was Just Seventeen. If you look at amazon.com, you will see that they are being offered for between $6000 and $9000! We are happy to be able to offer them to you at $250 a copy. Limit one to a customer which this small supply lasts! just me and this eel. Of the poets writing in English today, haiku has no better friend than former United States Poet Laureate, Billy Collins. . . . Collins now reads haiku regularly at his well-attended public readings. Because he is the most popular poet on the American reading circuit, none have his potential to influence the American perception of haiku. As you have seen yourself, the message he has to share about haiku has at its core the belief that a haiku is a poem of significance as well as sensual pleasure.